Not being familiar with Media Diary, it took me a minute to realise that it actually was, essentially, a blog post on a news site. My first reaction was that I had been directed to some facetious comment made by someone in response to a news article. Then it took me a minute or two more to parse it. Was it a bad joke being made by the writer? Was it actual reporting of someone else’s bad joke? Combine the headline (“Much ado” as in “much ado about nothing“) with the absolute lack of contextual framing, it was hard not to take it as a rather tasteless and heartless comment on the fact that the damage caused by Tropical Cyclone Yasi was not as extensive as it could have been. I wasn’t the only one who read those two short paragraphs as a bad joke by a Sydney journo at the expense of Queenslanders. Greg Jericho wrote a furious and impassioned rebuttal. Twitter was filled with retweets and comments (some of them apparently quite vicious). My normally stoic husband, who lived in Queensland his entire life until I dragged him down to Melbourne late in 2009, went to bed fuming after composing two posts of his own and writing emails of complaint to the Australian and to Overington herself. People were calling talkback radio in Sydney, and what they were saying seemed to me to be the best, the most amazing possible news: a roof off a cubby house, palm fronds down, and so forth. So it appears that it wasn’t a tasteless joke made by anyone, but actual reporting of actual calls to radio that Overington heard and was heartened by and felt the need to share on Media Diary. For now, let’s leave aside the fact that the post was written shortly after 9am, when it could be argued that it may have been too early to draw such a conclusion. Let’s not also point out too vociferously that it might have been the people least affected by Yasi — those not searching for missing loved ones perhaps, or sorting through the rubble of their demolished houses, or surveying devastated farms — who had time to make calls to Sydney radio. For now, let’s just consider that Overington and/or The Australian obviously realised that the original article was being ill-received. That people were angered and upset, and that the later expressed intention Overington had in writing those words had been completely lost in translation. Instead of leaving her original post as it was and appending an update to explain the context of her words, she effectively erased her original post in the problematic form in which it had been published. No one coming into this issue late will be able actually see the original artifact that became the subject of so much inflamed discussion (save for cache-mining and screenshots, of course). Self-quoting your post in a fresh article that replaces it and recontextualises it, is not even in the same ballpark. If this was print media, it would be akin to Overington knocking on the door of everyone who bought The Australian that day, handing them an errata sheet and standing over their shoulder while they pasted it on top of what was originally printed — whether they’d had time to read the original or not. With a print edition, of course, this is merely a thought exercise. The problem with online publication is that it can be done, quite literally, with the click of a mouse. And that’s precisely what makes this an extremely significant issue. The Australian is a news site. They have a responsibility to maintain an open and transparent public record of the news and commentary they report, as well as to conserve the context of cultural artifacts — and that includes daily news diaries/blog/comments, no matter how flippant, transitory or minor such artifacts might seem to be at the time. Retractions, clarifications and apologies are an important part of journalism — but making the object of your retraction, clarification or apology disappear from the public record is not. This is highly questionable behaviour for any journalist or media outlet. It undermines our trust. The information we have today might not be the same as what someone else saw yesterday, and what we talk about this afternoon might seem nonsensical to someone reading it tomorrow when they no longer have access to the same information. You expect this to happen on a private blog — although when private blogs become sites/sources of public conversation, then the ethics of revision and redaction also become more complicated — but on a news website? To me, that is crossing a very clearly-drawn line. Finally, I will also note that there is not even the whiff of an apology to be found within Overington’s revamped article. There is a lot of self-defence — but I really do care! here, look at all my tweets! — a smattering of disbelief — how can you think I would be so callous and ghoulish! — as well as the contextual clarification — someone really did call the radio! I just wanted to share the amazing news! — and that’s pretty much it. There is no acknowledgment of that fact her original article upset a lot of people — she addresses just one person, Greg Jericho, and in a particular rather than a representational sense — and there is no certainly no feeling of culpability for an article poorly written and open to obvious and understandable misinterpretation. In fact, the only person Overington seems to feel has been wounded here is herself, having been “saddened” by what Jericho said about her. It’s disheartening to see people unable to make a simple apology for fear of, what? Losing face? Admitting that you make mistakes and are occasionally guilty of acting in haste or in error? But the more I thought about it, the more I knew I had missed the mark. Not by much. It isn’t so much what I wrote about was wrong, but the way I went about it. It’s an excellent piece of self-analysis on the part of a blogger and well worth reading. More importantly, Jericho did not remove, edit or replace his original post. It remains within its original context, and you can still read it in its entirety. The only alteration is the addition of brief updates, appended clearly at the end: an apology and a note about the future moderation of comments (seems things got a little heated over there as well). Now that’s what I call online integrity. ‹ PreviousTender Morsels not for Feminists? Next ›Okay, seriously, enough now. 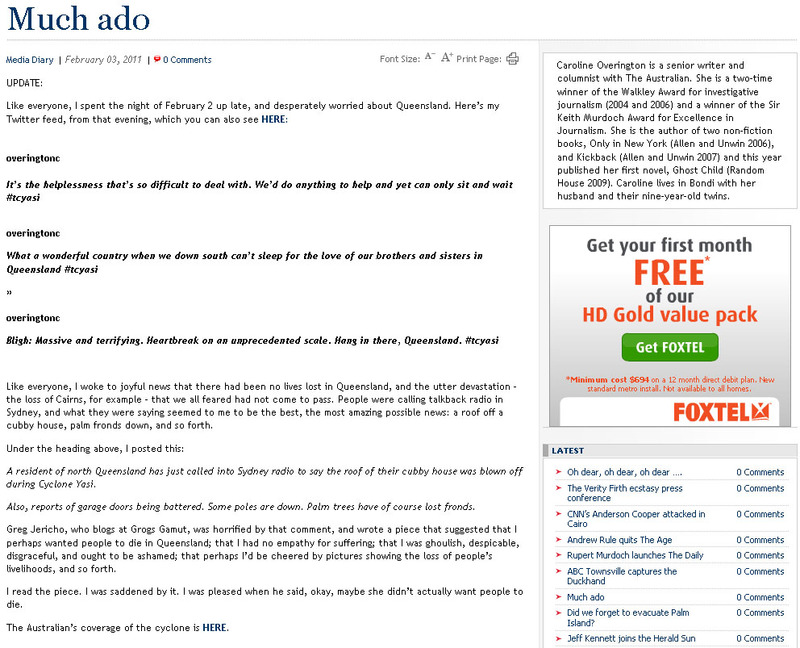 Jeebus, what is going on at The Australian. I don’t read it anymore as it’s too unpleasant. They seem to wear these kind of incidents like a badge of honour. Honestly they have the attitude of a teenager going through a particularly difficult puberty.